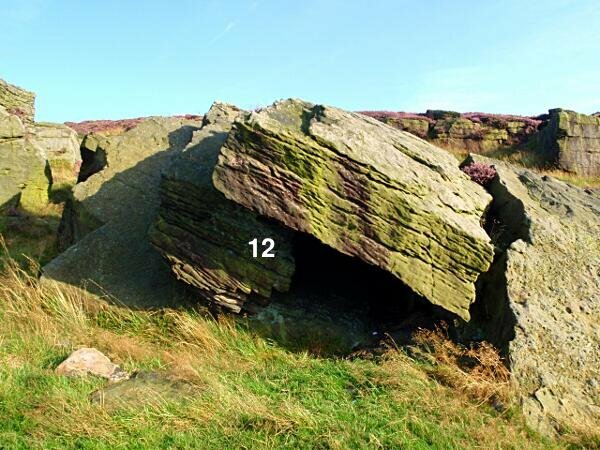 Piper Stones, also known as Shooters Nab Boulders, is small collection of boulders usually passed on the walk in to the main climbing at Shooters Nab. Not a major venue but a few good problems and traverses worth a quick visit to tick them all. All problems are on good rock with nice features. 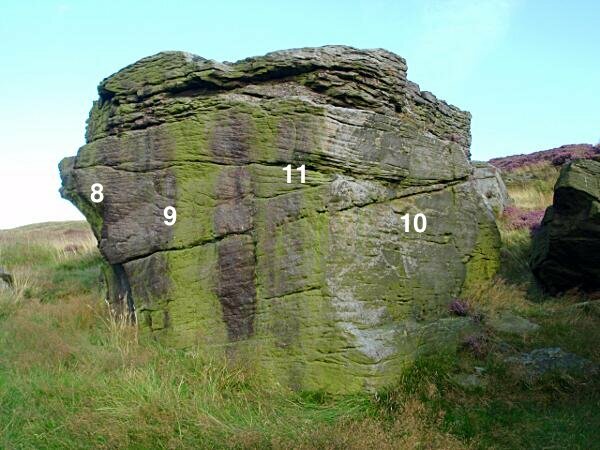 A brush maybe required for some of the North facing problems, numbers 8 to 11. Park up, considerately, at the limited parking at Woods Mount. There is then a fairly direct path through the field to a National Trust sign/stile onto the Kirklees Way footpath which leads you below the boulders within 10 minutes. 1) Font 3 The short face. 2) Font 4 The centre of the wall. 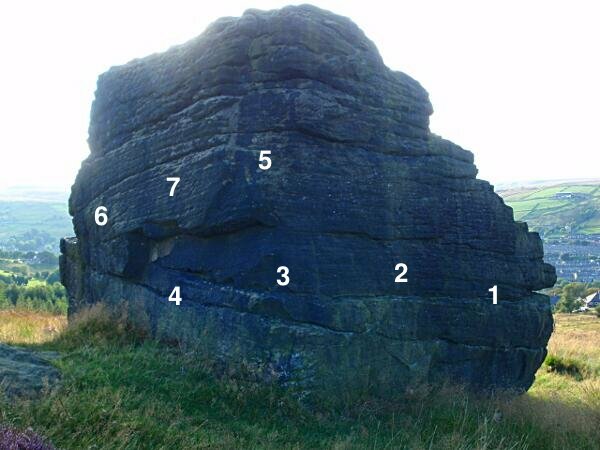 3) Font 3 The arete, beware, the flake sounds rather hollow. 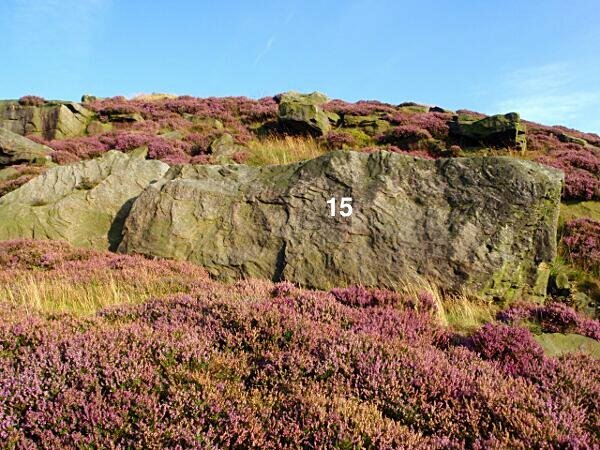 4) Font 4+ The wall from a sitting start, hands where the flake used to be! 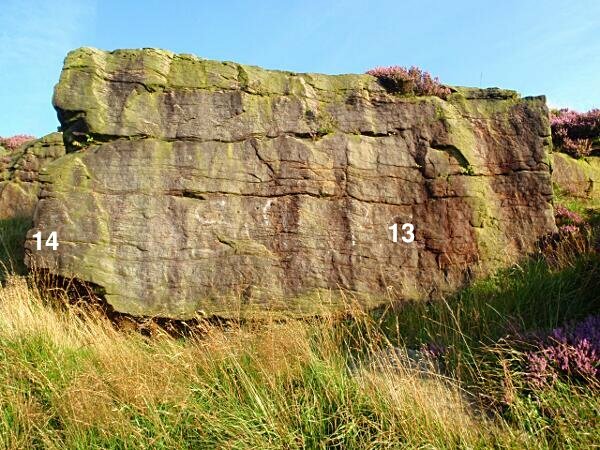 5) Font 5 A traverse of the two main faces, the top edge is out. 6) Font 4+ The centre of the face from a sit start. 7) CRIMPANZEES TRAVERSE - Font 6a Traverse the chest high crimps from a sitting start, the top edge is out. 8) Font 5 The arete from a sitting start. 9) Font 4 The middle of the wall. 10) Font 3 The small sidewall. 11) CRIMPERS TRAVERSE - Font 5+ Traverse on the crimps from right to left. 12) CAVE DWELLER - Font 6a+ Sit start on the sloper at the back of the cave, stretch for the hold on the lip and then mantle out the top. 13) Font 3 The middle of the small wall. 14) Font 4 The nose. 15) Font 3 Traverse the face from right to left without using your hands!